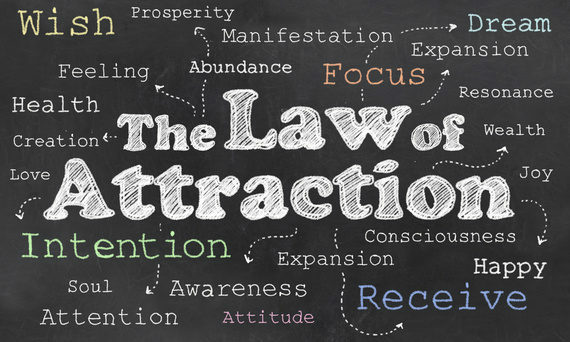 The Law of Attraction is a law that affects us all whether we utilise it or not. The basic premis is that what we focus on is what we attract into our lives. If you focus on negative you will attract negativity. If you focus on positive you will draw positivity. Once you start to use it your life will improve and your outlook on life will also. The Law of Attraction states that if you focus on something that is what you are drawing towards you. The phrase 'Be careful what you wish for' really applies here and is highly relevant. Your health, financial situation, friends, employment, situations and life are all being created by your daily thoughts. Your present has been created by your previous thoughts. Your future will be created by your thoughts in the present. Use your present to create your future. A great many of us focus on what we don't want, i.e. the problem. So, firstly decide on what you DO want. Be very clear about what you do want. Make sure it is what you DO want and what you wish to remove from your life. Make a list of these things you want, who you want to be, qualities you want to have, job you want, how you want you health to be, what you want to and have in your life. Make the list as long as you want. Whilst your first list, if you do it straight away is likely to be accurate, we would recommend reviewing your list. Is the list really what you want? Your soul mate should have the qualities you are looking for, e.g. kind, loving, generous, family oriented. However, is their hair colour relevant? Your dream car should have relevant qualities, e,g. comfortable, space for all the family, good safety record. Whilst blue may be a great colour if you found a car with all those qualities but it wasn't blue would you turn it down? If the mileage was 5,000 miles would you say no? So check each item on the list and make sure that what you are listing is relevant. When we focus on a subject the universe cannot differentiate between whether we have it already or we want it. The trick here is to make the list present tense. If you list things in the future tense then you are deferring the subject to the future. These are both statements to do with the future. Word them in the present tense. Go down each item on your list and change it to present tense. List it as though you already have it. Once you have your list read it aloud to yourself. How does that list feel written in the present tense? It may seem strange at first. Persevere though. Read it to yourself every day, at least, and ideally out loud. However, as a minimum read it to yourself in your head. Say it as though you mean it. Read the list every single day and watch what happens. Create your life tomorrow today.